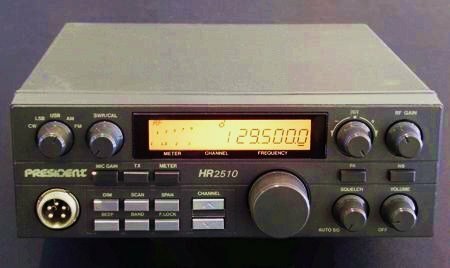 The Uniden HR-2510 is a mobile 10 meter transceiver that was manufactured in the late 1980s. The radio covers the entire 10 meter ham band (28.000 ~ 29.999 MHz) in CW, AM, FM, and SSB modes with 25 watts of transmitter power output. It's a compact package (about the size of a typical CB radio) and is great for operating 10 meters either as a base or mobile. This little radio is a great performer, and has quite a following - - but it's no longer made. Used examples can be found, and if you're lucky to have one of these gems, this web page can help you get the most out of it. Disclaimer: Be careful when performing modifications to your radio. Work safely, use appropriate techniques, tools, and personal protective gear, and above all, DON'T ATTEMPT TO PERFORM ANY PROCEDURE IF YOU DON'T UNDERSTAND IT! We are not responsible if you blow up your radio, burn your house down, or get your dog pregnant as a result of your reading of the information posted here. 'Nuff said! Improving Transmit Audio Quality in the HR2510 - - Sweeten your transmit audio by clearing a major logjam from the transmit audio processing chain! Improving the RIT Control in the HR2510 - - Do your ears a favor and fix the overly-sensitive RIT control. If you operate mobile, this is a MUST! HR2510 Tips and Tricks by Jim Shorney - This page has especially good advice about mods you should NOT be doing to an HR2510. Read it before delving into the box! Contact the author. If you have questions or comments about this content, they are welcome. Your feedback will help me keep this page up-to-date.